Post-Anna Hazare agitation, India is changing. This appears so, at least. I find people citing his early-April fast unto death against corruption at high places, in day-to-day conversations. Today, this soft-spoken old man — Anna Hazare is dreaded in all corrupt circles and revered by ordinary Indians for he, single-handedly, took too great a challenge head-on. Taking on the powerful and mighty in this country is not considered bravery. Many whisteblowers have been silenced with gun. Others who raise their voice are bought over or lured or suitably compensated. It was under this regime that Anna Hazare’s agitation became a mass movement. However, I had certain issues with his agitation that was organized in Indian capital New Delhi’s Jantar Mantar area. I, therefore, did not go to the hunger-strike place but did remain part of the groups that discussed Anna. During this period only, I watched an old Bollywood classic Guide (1965) in which the protagonist, played by Dev Anand, meets a celebrity death with rain ending the drought for which he was fasting in an affected village. And last week, one of my friends suggested that I must watch another movie ‘Well Done Abba’. I was told about its concept and the message it had for the Indian populace. “Wonderful comedy. Satire. You must watch,” my friend Atanu Das would say. I got its DVD and was briefed by the shopkeeper too that its story revolved around a village well that had gone missing. Hilarious, isn’t it? On way home, I kept on surprising myself as to how could a well go missing? A missing well? Water so precious that someone would run away with the well itself? But how? It’s not even the case of one stealing the goose that laid golden eggs. I kept arguing with myself… taps go missing, hand-pumps are lifted, water motors are also taken away by petty thieves… but a well going missing! Strange. How? I had absolutely no clue. Thus I surrendered. I kept looking at the DVD box in my hand while travelling in the metro train. I wanted to unravel the mystery quickly, sooner. Finally, in the evening the stage was set for the movie that had puZZled me for hours. But, lo… to my utter shock… when I opened the DVD box… to watch the movie, the disc was not there. I had been given an empty box. The CD was missing inside. Arrey, all the way I was thinking-mulling as to how a well could go missing. Now I was seized. I cursed myself… why didn’t I check the DVD at the shop, in the first place. But normally we don’t do it, na? We simply pay the money and carry the CDs. Anyways, next day… I complained to the shopkeeper who had no reason to disbelieve my innocence and he gave me a new CD that I watched the other day. Awesome. ‘Well Done Abba’ is indeed a wonderful movie that should have gone to the Oscars. Will the people who are be hind promoting-sending-selecting films, listen this? 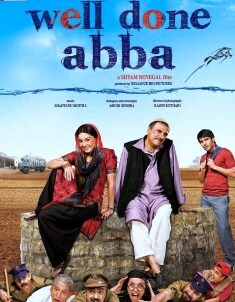 This movie – Well Done Abba – talks. It communicates with the audience. 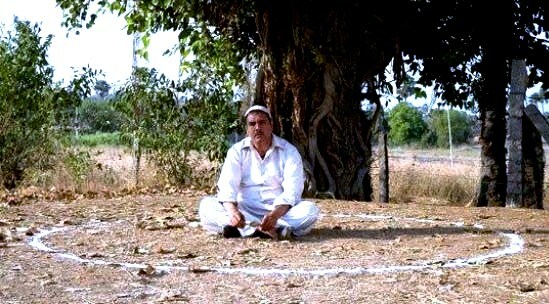 Released in early 2010, it is the story of a village man who wants to avail a government scheme to dig a well in his property. There begins a compellingly must watch story of a common man as to how he has to struggle tirelessly and corruptingly to bring water to his village. The hero – Boman Irani – appears more like the character that he plays of fighter Arman Ali who responds to the role that he’s asked to play by well-recognized director Shyam Benegal. Together, they make the village Chikatpalli set near Hyderabad alive. The film shot in 35 days is an excellent example of a common man’s fight with the system that we live in and promote. And in the end, you get a sweet pill. Grab it. Now, that’s next on my list!